From a secret crush.. to best friend.. to soulmate. What more could anyone ask for? This college romance started way back in the 2006 when the two were introduced by a common friend. Architecture school had them going through the trials and tribulations that every college student faces but they always had each other to lean on; And somewhere between those never-ending CAD classes, all-nighters and lunch hours, they fell in love! 9 years later, after much convincing of the parents, the couple got the chance to make it official and had the perfect pinterest-worthy Coorgi-Kannada wedding at Shibravyi in Bangalore. Being a perfectionist planner, Megha made sure that every detail of the wedding was spot on and exactly how she dreamed it to be and the fabulous pictures by PixelStory.in prove just that. 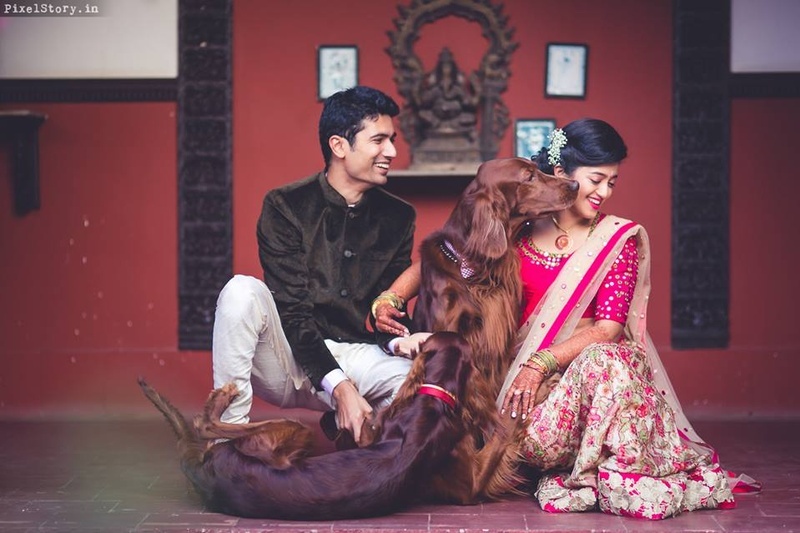 What to look out for: the charmingly rustic mood of the venue, their adorable doggies and the amazing pre-wedding shoot where each capture speaks a story. Kudos to PixelStory.in for capturing it all brilliantly. What brought us closer and helped gets rid of the initial awkwardness was a prank to pretend to be his love interest. Within a month of know each other we were inseparable. Although we ended up interning in the same office and doing a masters in the same subject over these nine years what works for us is that neither of us did anything just to be with the other. Coincidentally we wanted the same things for our individual selves which could be one of the things that worked in our favour. By the time I finished my masters, the topic of marriage came around. I was aware that my parents preferred someone from my same community and as I could not break their hearts, I had told Shravan that it was probably the best idea to end things between us. But Shravan mustered the courage and went ahead and spoke to my father without my knowledge and brought about a lot of friction at home. I knew that they had no problem with Shravan but the thing that was bothering them was that he wasn’t from the same community and at no cost did they want to give the world a reason to talk about their darling daughter. It took them a good seven months and a puppy to come around and now I see that they came to terms with it only a couple of months before the wedding when they were too busy to worry about what anyone said and all the credit for us being together today goes to Shravan for not giving up on us. From a sunset shoot in the middle of a lake to a laid-back rustic-chic shoot, every shot that PixelStory.in captured seemed to tell a story and every moment had its own magical romance frozen forever. What we especially loved was the couple’s choice of wearing everything from casual to dressy-formals to ethnic wear! The Sangeet was a fun-filled event where everyone seemed to be having a ball. Amongst all the cheer and laughter, Megha and Shravan’s smiles were certainly the widest! The entire venue was decorated in some creatively used marigold flowers and origami. Paper lanterns took care of the lighting while colourful origami cranes added a vibrant touch. As the event proceeded with the dancing and singing, the usually silent Megha was seen burning up the dance floor in a lovely custom made pink and white lehenga with floral prints and mirror-work. Soon enough, her husband-to-be joined the festivities, giving her equal competition in a brown velvet bandhgala by Paresh Lamba. Once again, the amazing yellow décor against the rustic background didn’t fail to impress us. Megha looked gorgeous in a pink and gold Coorgi-style saree from Kanchipuram. The colours fused together gave a rustic vibe that matched the mood of the venue. Her stunning gold jewellery complimented the neckline of the saree drape. Our groom, Shravan made his entry dancing to the tunes of Jumma Meri Jaaneman in a simple yet classy red and white ensemble also by Paresh Lamba. The ceremony was a combination of high spirits and emotional moments. Amongst all the highs and lows, the couple felt that the event was truly complete with the presence of their adorable dogs! I loved the fact that my dogs were present with us at the event. I can never forget the happiness I felt seeing them around. It really was a dream that I never thought would be a reality. As soon as we got to the venue the younger one Hugo who was just about a year old by then charged into my room and jumped into the pool adjoined my room. It was a great start to the event. Although he did not do it intentionally he was so full of energy that he did not observe the water body which had a net thrown over it. Megha donned an orange saree with a custom designed blouse while Shravan looked dapper in a 3 piece suit accessorizing with a bow-tie and an elegant lapel-pin. Once again, the wedding planners at 3 Productions did a fantastic job of setting up the entire venue. The lighting added a warm, beautiful note to the event. The use of fairy lights wrapped around trees, suspended bulbs and candle-lit chandeliers was rather breath-taking.